Vodafone India has silently started offering two new plans for its subscribers. These two plans are Rs. 181 and Rs. 195, and as the price itself suggests they both are aimed at Reliance Jio’s Rs. 149 tariff plan. If you remember, Bharti Airtel and Idea Cellular also introduced plans of similar price. Coming back to the plans offered by Vodafone, the Rs. 181 plan is aimed at 2G users. 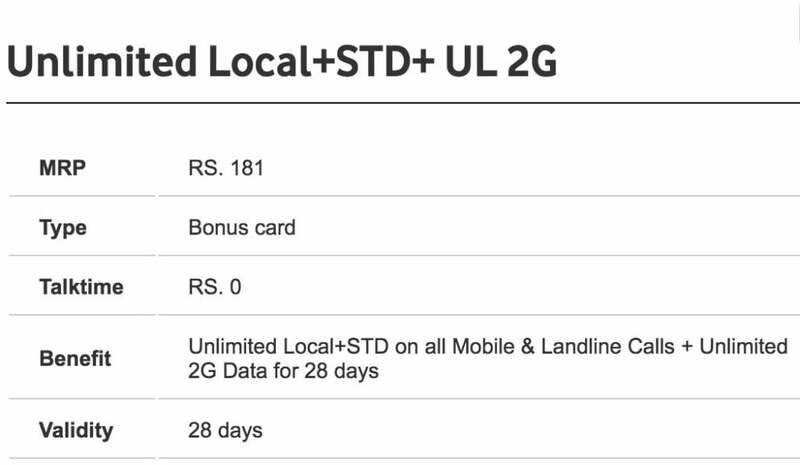 It gives unlimited voice local & STD calls and unlimited 2G data for 28 days. This is a bonus card from Vodafone India. And the Rs. 195 plan is for all users- 2G, 3G, and 4G. This is also a bonus card and it offers benefits of unlimited voice calls and 1GB data for 28 days. That said, users have to adjust with just 1GB data for the entire month. Also, the unlimited voice calling is capped to 250 minutes per day and 1000 minutes per week. And as said earlier, this plan is valid for all the Vodafone 2G, 3G and 4G users. Competition wise, Airtel also launched a similar plan of Rs. 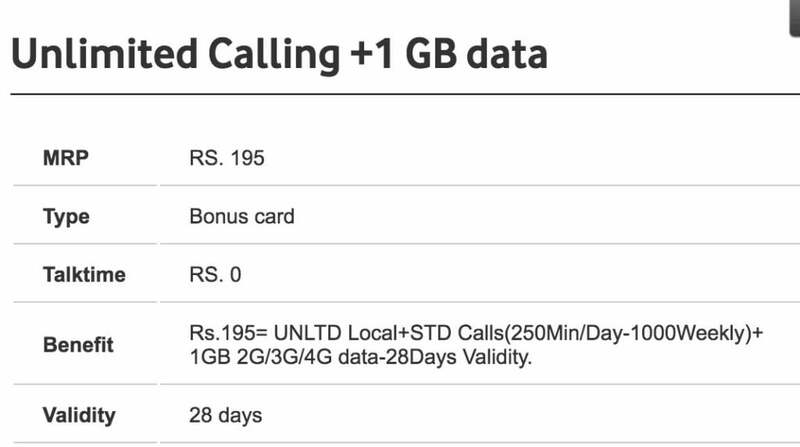 199 that gives unlimited voice calls and 1GB data for 28 days, and Idea Cellular’s latest Rs. 198 plan also gives same benefits of 1GB data and unlimited calls for 28 days. Idea’s Rs. 198 plan is for existing Idea customers, whereas new users can recharge with Rs. 178 pack to enjoy same benefits. All the three incumbent operators launched these plans to combat Reliance Jio’s Rs. 149 plan. As an effect of the operators launching similarly priced plans, Reliance Jio increased the data benefit of the Rs. 149 plan to 4.2GB from the previous 2GB. However, the plan now has a daily FUP data limit of 0.15GB, which is underwhelming. Also, the plans of incumbent telecom operators don’t come with any daily data capping. Note: This plan is only valid for A.P circle. Vodafone has cheated under this plan, I have obtain this plan on 5th Nov 2017, from 21st Nov 17. i.e. midnight of 20th Nov 17 my all incoming and outgoing calls are restricted in roaming network . At my local network I am only able to receive calls, and while outgoing I did receive IVR saying you dont have sufficient balance. No retailer have any Idea about this.